This scene is typical of Minnesota in July. The soybeans are waist high and wet until 10 am when the sun finally burns away the dew that set in the night before. I can remember walking beans as a boy and you were wet and cold in the morning and then by afternoon wishing you could be wet and cold again for a little relief from the heat. 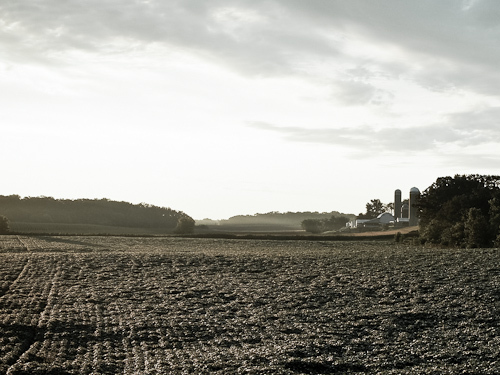 This entry was posted in Uncategorized and tagged copyright ryan ware, crop, dew, farm, farm life, field, golden hour, potato farming, soybeans, sunrise. Bookmark the permalink. Walking beans in the morning pales in discomfort level compared to detasseling corn in the morning with moisture running down your arms and soaking your pants and shoes. You brought back memories for me with this photo, Ryan. I never did detassel. That sounds like way less fun.